Kit also includes an EMGO Air Filter for Tuning as well as a pair of main jets to get it right. I have reworked this kit several times in the (Nov 15) to perform ever better. Added a shorter manifold and custom made cable for Heist which should work on all the CCW bikes, so throttle cables are custom made pre order. The air intake also has been modified to do a little more. Opens your fuel and air flow from stock with larger manifold that feeds a Flat Slide OKO carb with air adjustment as well as Idle with a Power Jet for huge top end. The air intake does well with a 90 degree intake boot with velocity Stack Feed. A cone filter is also included for extra tuning if needed. A cable change is needed and one is included. 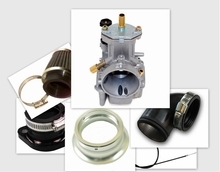 There are two versions of what you might need depending on your throttle body. Mod adds torque to a modified exhaust on the Cleveland Cyclewerks Tha Heist as well as Misfit. A radical approach for some with several ways to tune for air intake to jets. Both pilot and main jets can be changed easily with Kehien jets. A throttle cable change is needed when install on a stock throttle body on a Cleveland Cyclewerks bike. You will be contacted for jetting and cable needed. A cable may also be added to the choke if required.